Course: A run from McCabe’s trailhead to Scary Hill road then loop around Graceland trail to Josie’s and onto Gateway and then return to the start. Great trails through the sagebrush and rocky outcroppings of Hartman Rocks. Distance: Approx 8 miles, all on single track trails and dirt roads. Meet: At the McCabe’s Lane trailhead at Hartman Rocks. Take Hwy 50 west from Gunnison for 2.5 miles, then turn south and follow McCabe’s Lane (County Road 32) for 1.5 miles and the trailhead will be on the left. Course: An out and back run on the Snodgrass trail through aspen groves and with nice views of Crested Butte mountain from Washington Gulch to just short of the Gothic road. Distance: Up to 6 miles, all on single track trail. Runners can turn around at any point. Meet: At The Alpineer in Crested Butte to carpool by 6pm or at the Snodgrass trailhead on Washington Gulch road by 6.20pm. Course: From Gunsight Pass road down Slate River road to Lupine II trail. Climb Lupine II and then up Smith Hill road to Gunsight connector trail, then down to Gunsight Pass road and back to the start. Distance: Approx 6 miles, all on single track trail and dirt roads with great views down into Slate River valley. Meet: At the parking area on Gunsight Pass road, just off Slate River road about 4 miles north of Crested Butte. Course: Start at the Walrod Gulch trailhead, up Lower Cement Creek trail to the Homeowners trail then down to Pioneer guest ranch. Cross Cement Creek road then onto trail 409, up past the caves and over trail 418 to Walrod Gulch and back to the start. Meet: At the Walrod Gulch trailhead on Cement Creek road approx 3 miles from Hwy 135. Hang around after the run for the 23rd annual “Brian’s beer, brats, boys and babes bash” so bring warm clothing and enjoy a beer (or soda) and a brat around the bonfire and celebrate the summer solstice. Course: A preview of the first part of the 4th July 1/3 marathon course. From the Gothic townsite to Treasury road in Mt Crested Butte. Distance: 5 miles, all on dirt roads and paved roads. Meet: In the ski area main parking lot, opposite the Nordic Inn in Mt Crested Butte for a 6.00pm shuttle to Gothic. The run will start approx at 6.30pm and will be followed by pizza and refreshments at the finish. Course: An out and back run on the new Baxter Gulch trail from the Crested Butte trailhead to the intersection of the Carbon trail. A steady climb with great views of Crested Butte and of Whetstone Mountain. Distance: 10 miles all on single track trail. Meet: At the Baxter Gulch trailhead, just south of Crested Butte on Hwy 135. Course: From the Town of Crested Butte to Woods Walk, Budd trail and Upper Lower Loop to Gunsight Pass road then Lower Lower Loop to Peanut Lake road and back to the start. Distance: 8 miles on single track trail, dirt roads and a short section of paved road. Meet: At the Meyer house at 124 Maroon Ave in Crested Butte.. Course: From Rustler’s Gulch down Gothic road to the Gothic campground, up trail 403 to the head of Washington Gulch, then up and over Paradise Divide and around to Schofield Pass. Climb trail 401 then descend back to Rustler’s Gulch. Great views of all the valleys north of Crested Butte and meadows of wildflowers. Distance: Approx 15 miles, all on single track trail and dirt roads. Meet: At the Rustler’s Gulch turnoff about 2 miles north of Gothic. Please carpool if possible and carry food, water and energy drink. Course: Cement Creek trail to Waterfall Creek trail, then to Waterfall Creek Cutoff trail and then down to Cement Creek road on the Warm Springs trail. Views of Italian mountain, Cement mountain and the Cement Creek valley on trails through woods and meadows. Distance: Approx 9 miles, all on single track trails with a couple of creek crossings. Meet: At the Cement Creek trailhead about 6 miles from Hwy 135 up Cement Creek road. Carry food, water and energy drink. . Course: From Brush Creek road run the Canal trail to Farris Creek trail. Climb Farris and then drop down to the intersection of Strawberry trail. Run Strawberry over to Brush Creek road then return to the start via Death Pass and the Canal trail. Distance: Approx 9.5 miles all on single track trail and dirt roads with two creek crossings. Meet: At the Canal trailhead about 4 miles from Hwy 135 on Brush Creek road. Carry food, water and energy drink. Strawberries to be served after the run. Course: From Camp 4 Coffee in Crested Butte to Camp 4 Coffee in Crested Butte South via Tony’s trail, Upper upper loop, Brush Creek Road, Canal trail, Strand bonus, Trail 409, Walrod cutoff, Walrod Gulch and Cement Creek road or shuttle to Brush Creek road and then follow the course to the finish. Course: From 3rd St and Maroon Ave in Crested Butte to Peanut Lake road and back on the Woods Walk trail. Run with the High School Cross Country team. All entry fees and donations go to the Titan Booster Club supporting High School sports. Distance: 4 miles on single track trails, dirt roads and paved roads. Meet: At Totem Pole Park in Crested Butte, 3rd St and Maroon Ave. Pizza at the Brick Oven follows the run along with the drawing for the Paradox Footwear raffle. * These events are not Mountain Runners events and require additional entry fees. $25 annual membership in the Crested Butte Mountain Runners includes entry into all runs except as noted above. Non members pay $5 per run. Refreshments are provided after each run but runners should carry their own food and drink while running if necessary. Information an all runs may be obtained from Martin Catmur at (970) 275-7763. Run to win! The Paradox Footwear Mountain Runners raffle. Win a pair of shoes. Attend four or more Mountain Runners runs and be entered into the end of season raffle. Your name is entered after you have attended (or directed) four runs. At the final run we will draw names for two pairs of trail shoes from Paradox Footwear. When you are in the market for a pair of shoes, check out the selection at Paradox Footwear at 428 Elk Ave in Crested Butte. Some runs are located on the Gunnison National Forest under permit from the Forest Service USDA. Some runs are held on Crested Butte Land Trust (CBLT) property. No part of the fee for this activity is being paid to CBLT; CBLT is permitting the described activity to occur on CBLT lands free of charge. 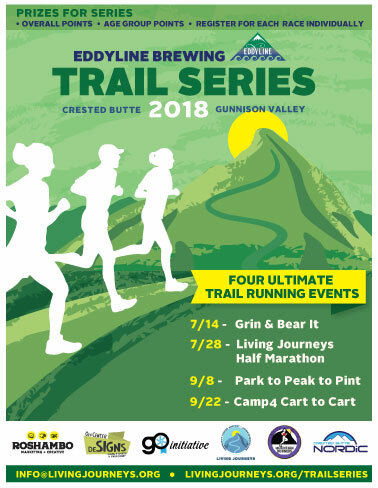 Eddyline Brewing is proud to present the fifth annual Eddyline Trail Running Series. This series of four trail running events includes trail races along scenic trails in Crested Butte. From July to September, each race offers new terrain, vistas, and mountain views at distances ranging from 9 to 19 miles. Earn points at each event to compete for prizes and every race supports an important nonprofit organization in the Valley.